The National Football League's Green Bay Packers played two or three home games per year at County Stadium from 1953 to 1994. The Packers' final game in County Stadium was a 21-17 victory over the Atlanta Falcons on December 18, 1994. The last touchdown was scored by quarterback Brett Favre (coincidentally, against the team that originally drafted Favre and from the city where the Braves had moved almost three decades earlier). Traditionally, the Packers would host at least one team from NFC Central division at County Stadium each season. Only once did the Packers play their ancient archrivals, the Chicago Bears in Milwaukee, defeating the Bears in 1974. The Detroit Lions and Minnesota Vikings were the Packers' most frequent foes at County Stadium. 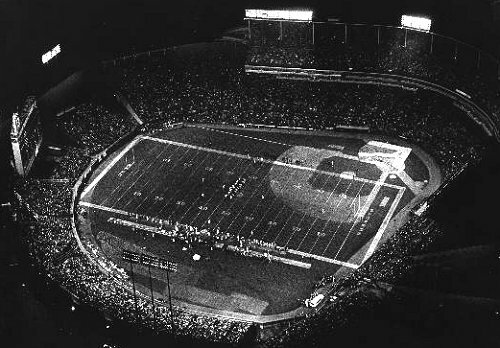 The University of Wisconsin-Milwaukee football team also called County Stadium home until the team disbanded following the 1974 season. 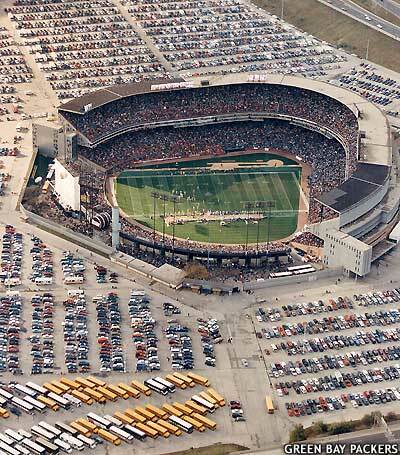 While originally built with the intention of luring the Packers to Milwaukee permanently, County Stadium was treated primarily as a baseball stadium following the relocation of the Braves. Upgrades and seat expansion were done almost exclusively to suit the needs of the Braves and later the Brewers. It was thus somewhat problematic for football, making only the bare minimum adjustments to accommodate the sport. The playing surface was just barely large enough to fit a football field. The football field itself ran parallel with the first base line, with both end zones spilling over onto the warning track. Both teams occupied the east sideline, on the outfield side. It only seated 56,000 for football, and many seats had obstructed views.